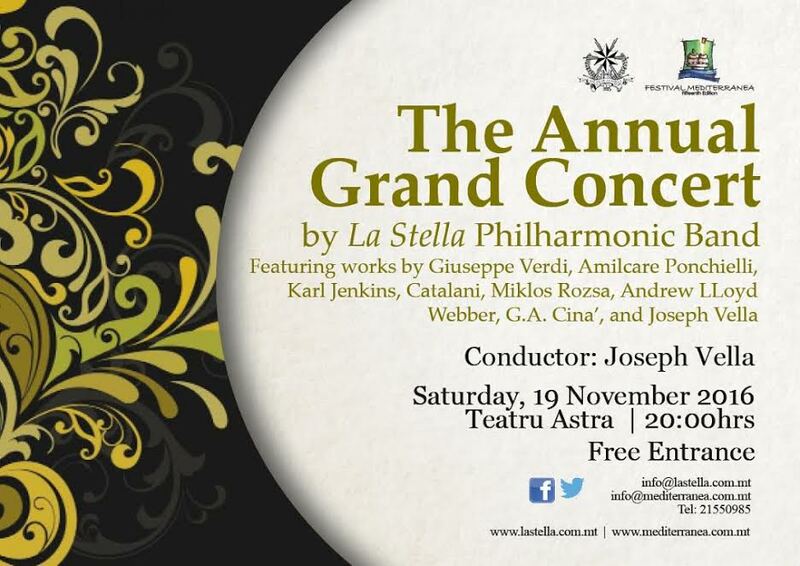 The Annual Grand Symphonic Concert by La Stella Philharmonic, scheduled for Saturday 19th November, will bring to a fitting end the fifteenth successful edition of Festival Mediterranea. The concert, which starts at 8.00pm, will be held at Teatru Astra. Entrance to the event is free of charge. The symphonic concert brings together a strong 70-member band, including widely acclaimed soloists, under the direction of Prof. Mro. Joseph Vella, in what is considered the La Stella Philharmonic's main event throughout the winter season. Saturday's concert sees the band interpret a selection of classical, Romantic and contemporary music, in what is increasingly becoming a much-awaited event for music lovers and musicians on the Maltese islands. The programme includes works by Giuseppe Verdi, Alfredo Catalani, Karl Jenkins, Andrew Lloyd Webber, G. A. Cina', and Joseph Vella. Patrons are cordially invited to be seated by 7.45pm. Seating is on a first-come first-served basis. More information is available on www.mediterranea.com.mt or 7925 6897. The concert almost brings to a close the 15th edition of Festival Mediterranea, organised by volunteers at Teatru Astra. The festival started on 27th October with the first of two nights of Giuseppe Verdi's much awaited opera; Aida, another tour-de-force for Teatru Astra. Festival Mediterranea is supported by the Gozo Cultural Support Programme, as well as Citadel Insurance, General Softdrinks and the Victoria Local Council. More information is available on www.lastella.com.mt and www.mediterranea.com.mt.